We are delighted to have been nominated in the NEFF MasterPartner Awards 2019 for Best Kitchen Showroom. The MasterPartners Awards received over 200 entries and their team of judges worked tirelessly over a four week period to whittle each category down to a prestigious few. Gideon Robinson was shortlisted ... Read more. We had a crowd at both our studios during our Demo Days last month, enjoying a glass or two of prosecco whilst tasting some delicious foods. Carol, our expert from Siemens was at our Southside Studio in Haggs Road cooking an array of savoury foods, cakes and biscuits throughout the ... Read more. 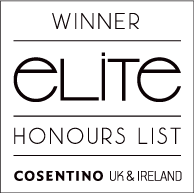 We are delighted to have been presented with the Elite Premium Cosentino Honours List award this year at Raymond Blanc’s Le Manoir aux Quat'Saisons! This is a prestigious industry award that is only awarded to the 'best of the best' Elite Premium Studios who offer the highest level of customer ... Read more. One of our favourite meals to prepare in the kitchen is the mighty burger! There’s nothing better than hearing that sizzle as the burger cooks; or the crunch of lettuce, onion and tomato as you take your first bite. To complete the burger however, you need the one thing that ... Read more. DeanEdwardsPhotography.com came to take photos of the showroom today which we will post later in the week. Thanks Dean . Here's one of the photos. Can you guess who it is? Its not Kate or Radley. The photo is featuring in our advertising.... Read more. LINN hifi have teamed up with Gideon Robinson! We are all so proud to have a world renowned manufacturer endorse our fantastic new studio and look forward to hosting the LINN lounge events through the year. If you’d like to join our events mailing list, please send your contact information ... Read more. Fulltime admin assistant with sales experience. The position is based in our Haggs Road Studio in Glasgow and we invite applications from people seeking full-time hours. The successful applicant will have experience and passion within the kitchen, furniture and home interiors industry. You must be computer literate, confident on the ... Read more. We’ve been making a number of changes to our showroom recently and one of the most eye-catching is our new modular system from Novamobili. The Italian designers are really innovative and the modular system makes really good use of space particularly in rooms with high ceilings. The systems can be ... Read more. We were all delighted that so many of you could make it and share anniversary with us. Its been another fantastic year and we have all made new friends. We aim to make a positive difference to the way you live in your home through good design and great materials. ... Read more. One of the challenges at Gideon Robison is making sure we keep our customers informed about new styles, colours and finishes and future trends. The only way to properly find this out is to visit the designers in person and chat to them about it. We’re fortunate because we’ve an ... Read more.